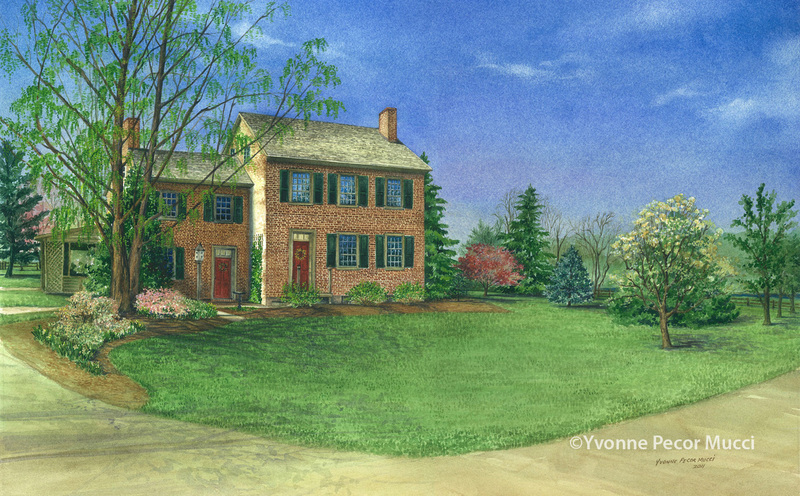 I participated in the Cohansey Riverfest Plein Air Competition in Bridgeton, NJ a few weeks ago. The criterion was to portray the Cohansey River Watershed. I was really torn choosing which view would make for a better painting, Mary Elmer Lake or the outflow from the dam. Rain was threatening and the sun was hard to find, so the outflow view was the best choice. It all worked out to a great day of painting outdoors and a 1st place award. 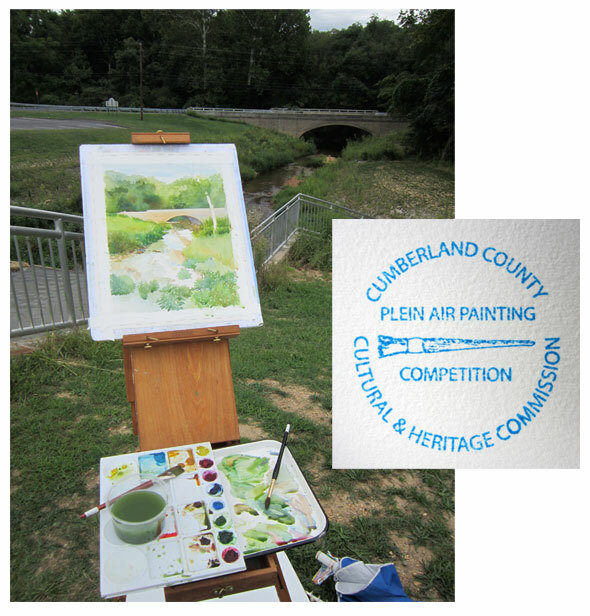 This plein air competiton was sponsored by the Cumberland County Cultural & Heritage Commission and Gallery 50 in Bridgeton, NJ. Thank you to Matt and Gallery 50! 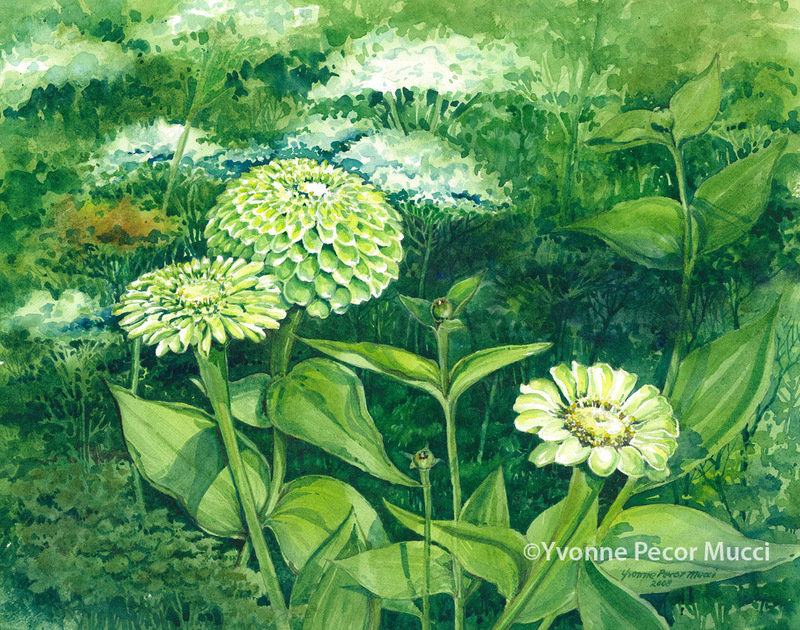 This painting is part of the Nature & The Landscape, An Environmental Perspective exhibit which runs through September 27th at Gallery 50. There are 90 beautiful paintings on display. As an artist you are always trying to improve and stretch your skills. 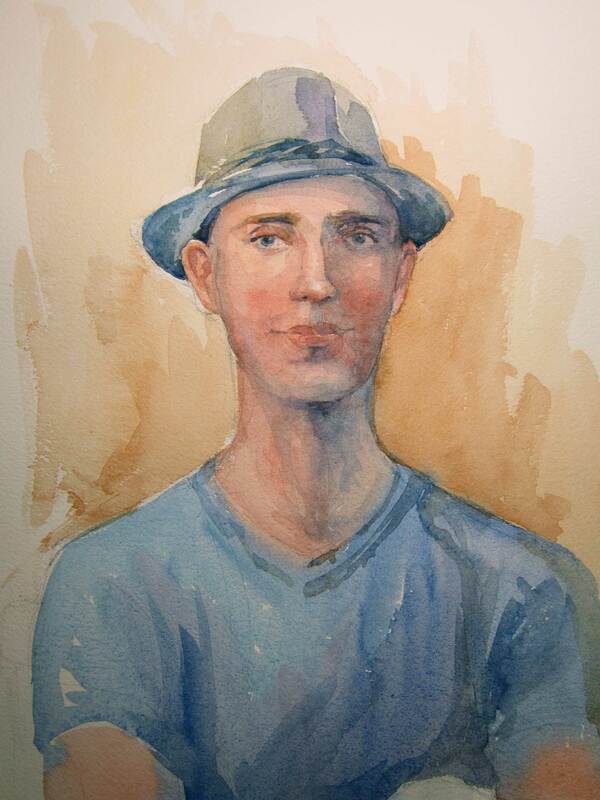 I wanted to work on my portrait painting and had the pleasure of taking a one day watercolor workshop with Ken Hamilton at the Gloucester County College. 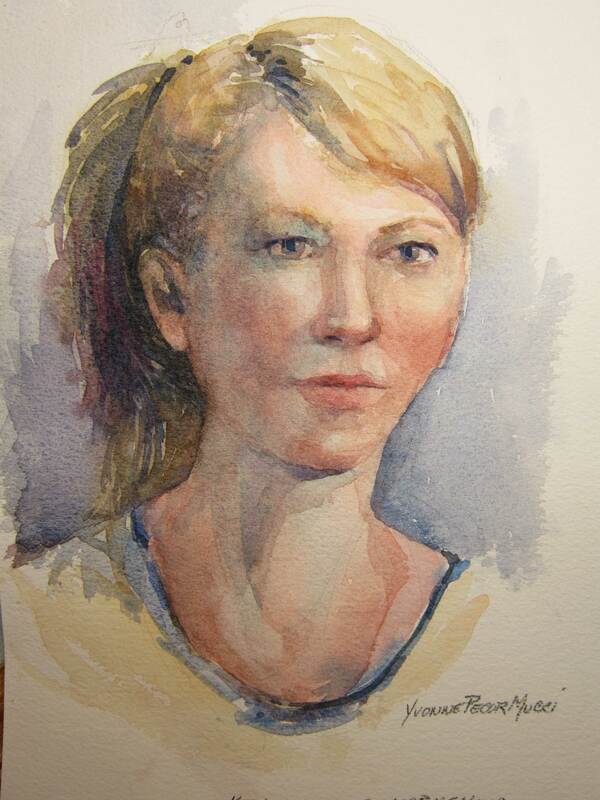 Ken did a great demo and a warm-up exercise, then we were given the time to paint from a model. 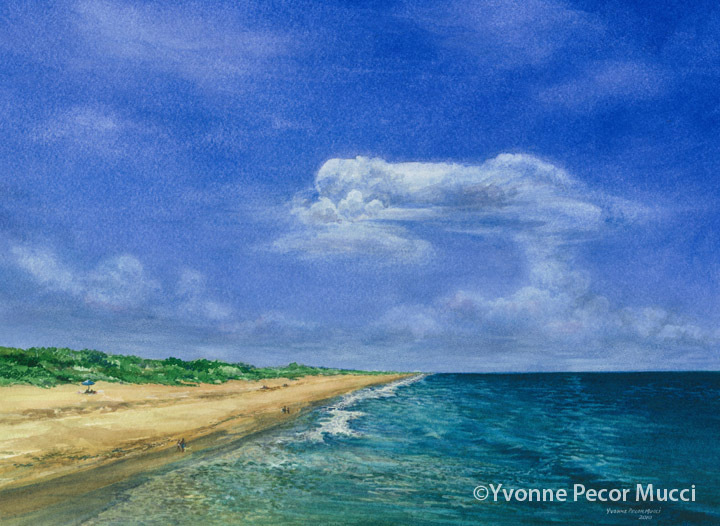 You can’t expect to walk away with a fabulous painting at the end of a workshop, but you will gain a different outlook and skills to incorporate into your paintings. 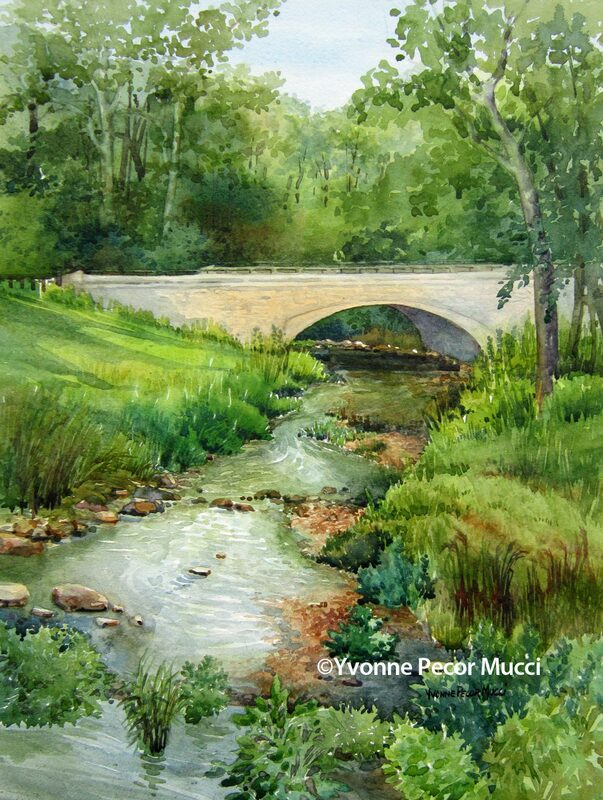 I love the freshness and flow of Ken Hamilton’s watercolor paintings. I am trying to loosen up a little in my own painting. The workshop definitely helped me to loosen up a bit. Now all I have to do is paint a whole lot more portraits to see improvement. Click on any painting to enlarge. 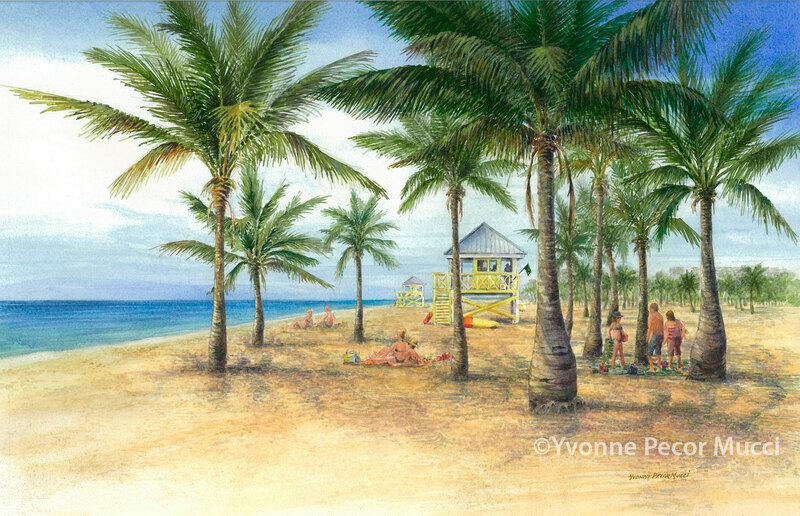 Key Biscayne’s Crandon Park is one of the best beaches near Miami. I love that it has huge palm trees on the beach. 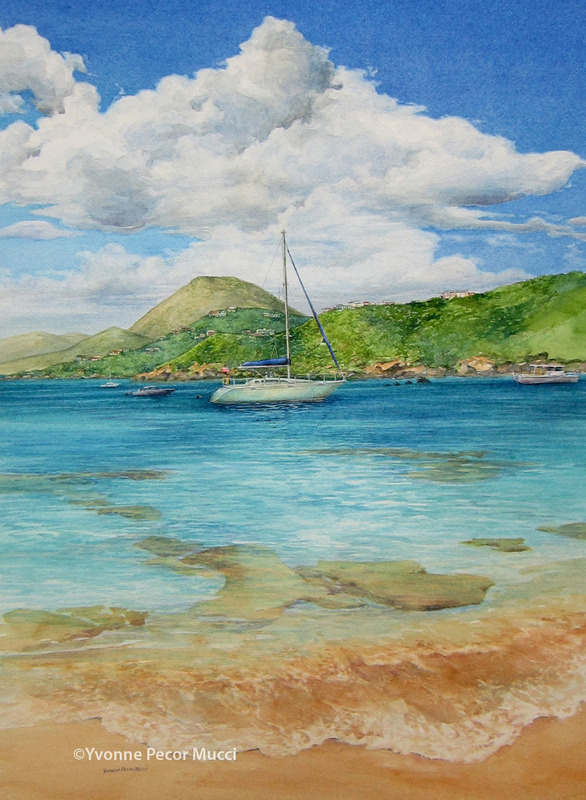 This watercolor was painted as a gift to someone who also loves this beach, maybe more than me. 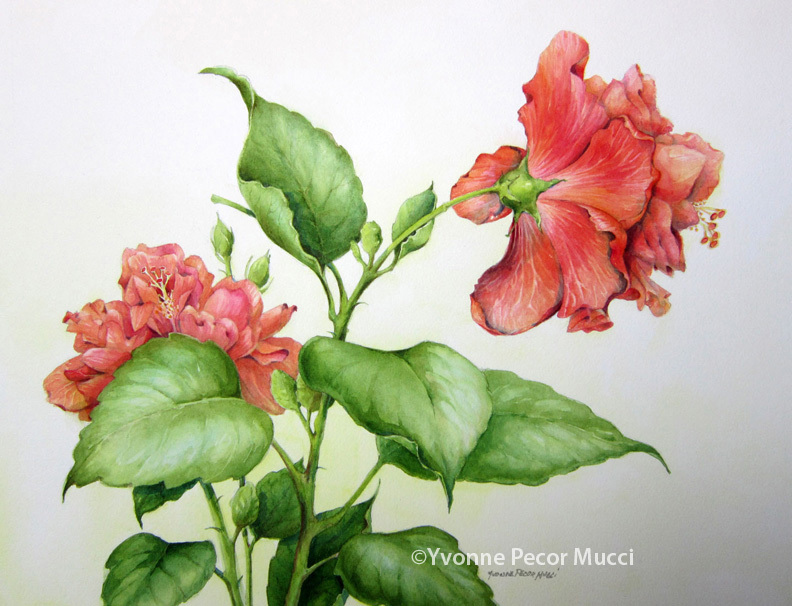 It is painted on 140 lb D’Arches watercolor paper. I masked out the trunks of the palms which let me paint the sky, water & beach with more flow, but in hindsight I would only have masked the lifeguard stand. Click on the images to see more painting detail. 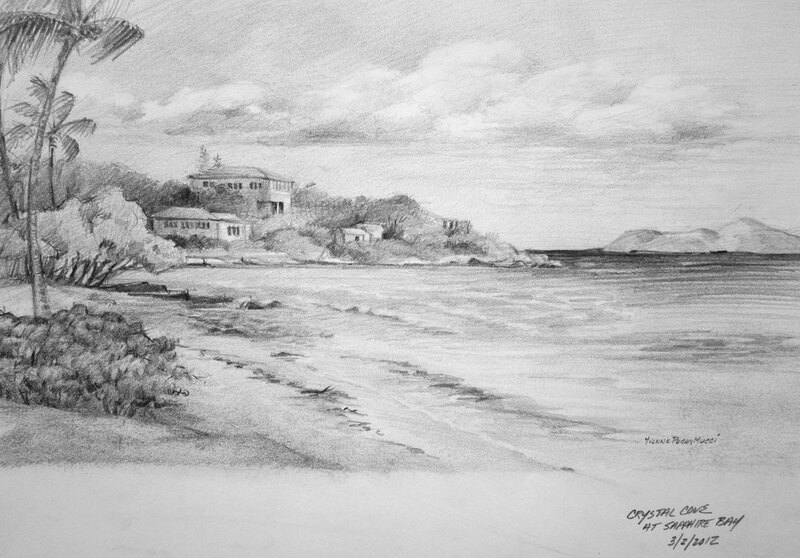 The painting composition has been changed from the original sketch. 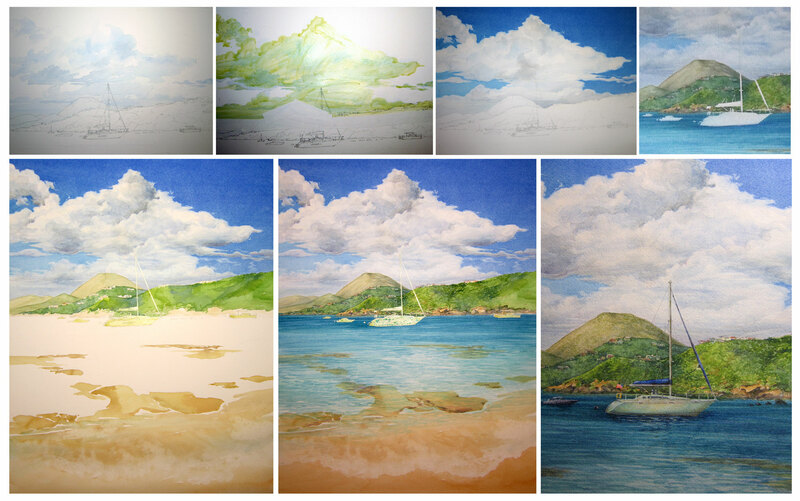 I wanted to include the dynamic clouds that build over St Thomas and the coral reef in the foreground. People have asked if the water is really that color. It is that color, depending on the time of day and the amount of sunlight flowing through the crystal clear water. It is a beautiful thing to observe in person. Click on the images to get a better view of the detail. 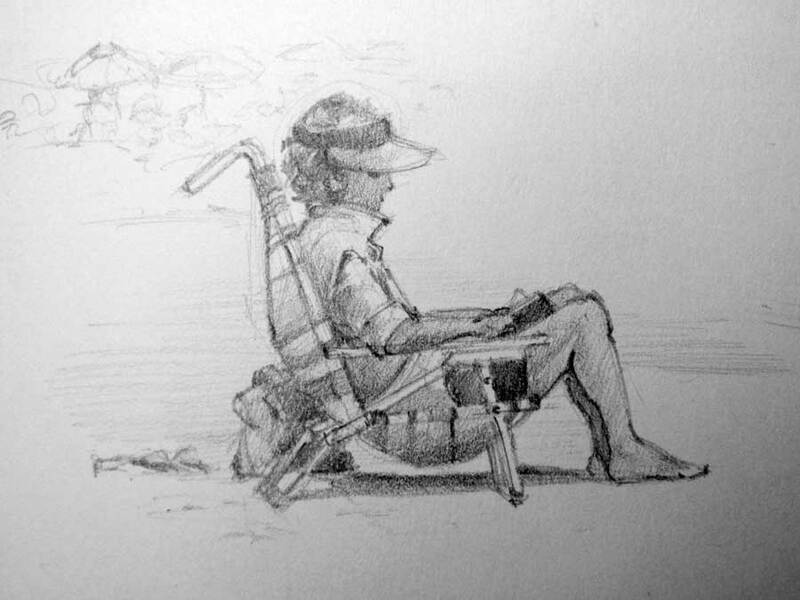 This sketch was done on the first day of vacation. Wish there was more time to sketch, but now I need to start painting. Depending on the time of day, Shark Island will illuminate and jump out of the sapphire and aqua water. It is a beautiful sight to watch various sail boats cross the water. 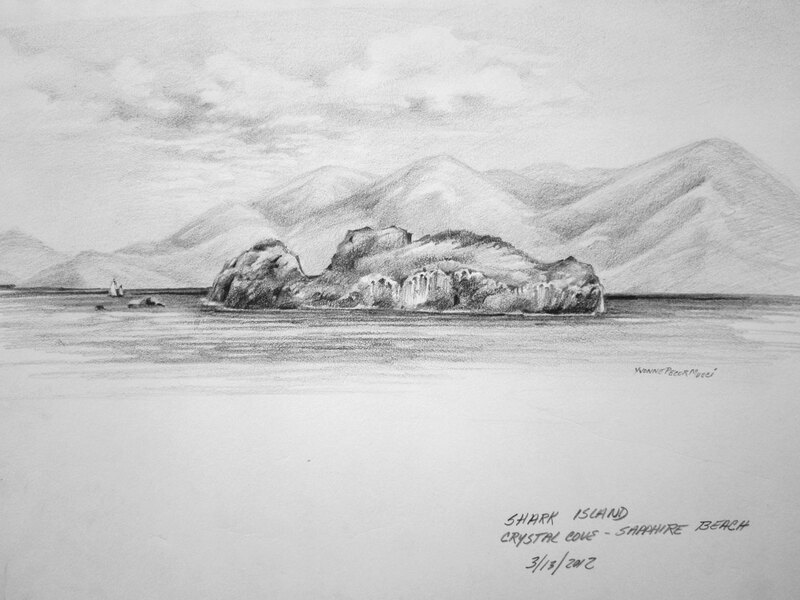 St John is located to the right of the sketch. 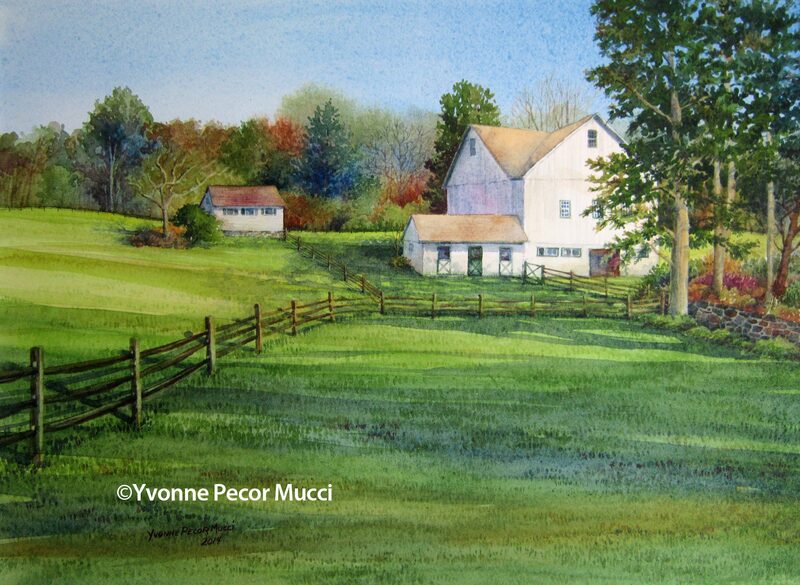 Driving in southern NJ you’ll see some beautiful open spaces with active farms. This was painted trying a different technique on the grass. I travel to southern Florida quite often. You have to go pretty far south before you hit that beautiful blue/green water. As the title of this post states, it is one of my favorite places. I love the way the sky changes the color of the water. Every day is different and you can spend endless hours trying to capture the feeling you get when you’re sitting by the ocean. Always have a camera with you to catch the sky. 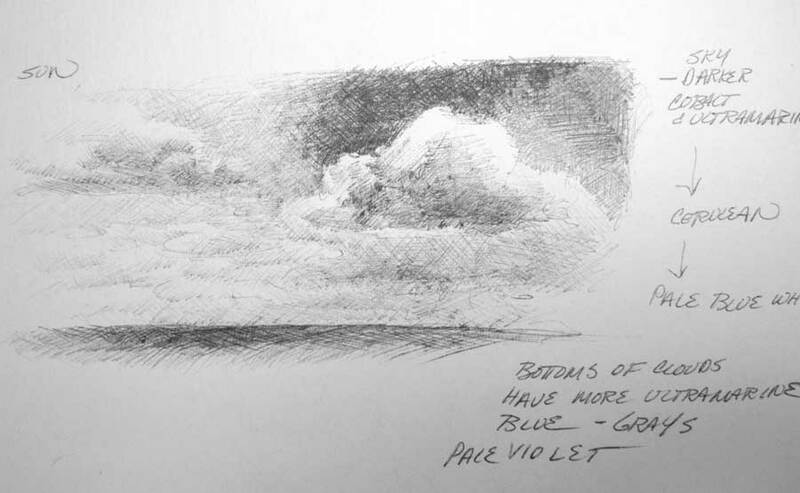 A sketchbook is also extremely helpful because you can make detailed notes on the color of the sky and water. 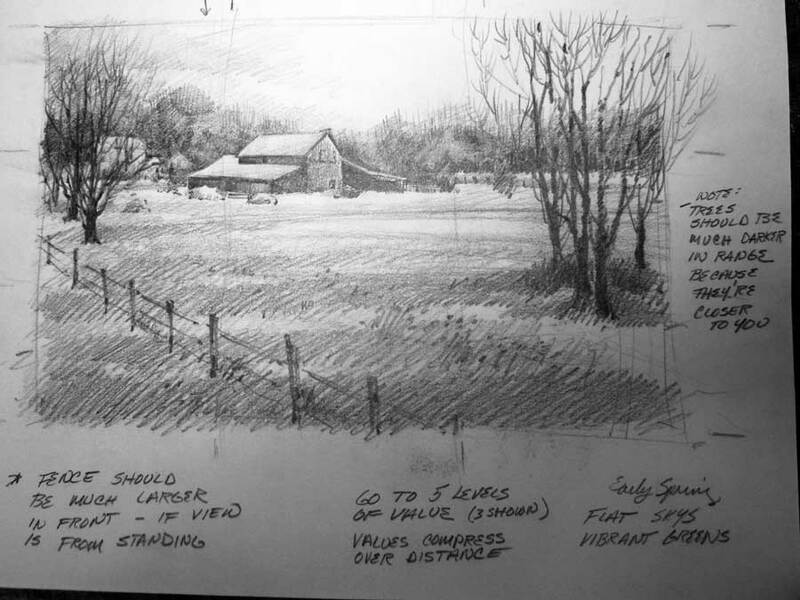 Often a detailed sketch will give you the additional information that a camera doesn’t capture. Talk about a perfect day at the beach. Pictured is a typical day at the Jersey Shore. Strathmere beach is usually pretty quiet and it wasn’t crowded this day. The sky was solid blue and the light was perfect. 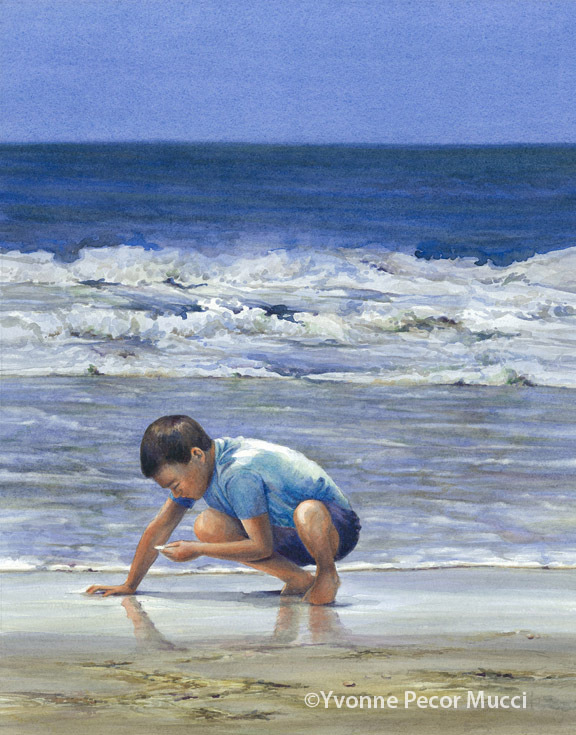 I sketched this boy as he played and took a series of photos which turned into a beautiful painting. Right before we left, I gave the boys grandparents one of the black and white sketches I had completed. 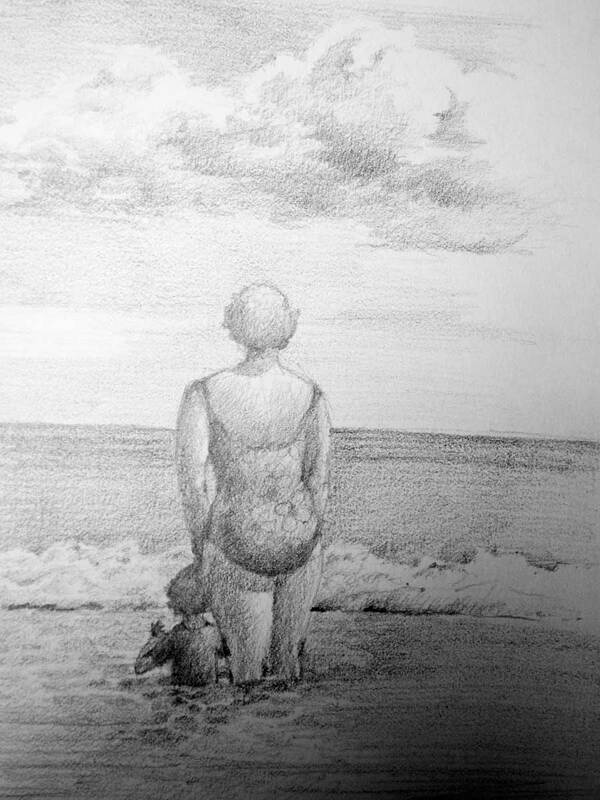 I wanted to learn how to portray waves and putting the boy in the foreground gave the waves the right perspective. Plus it made the painting much more interesting. The color of the water and the sand is completely different in southern New Jersey compared to Florida. Much cooler colors. 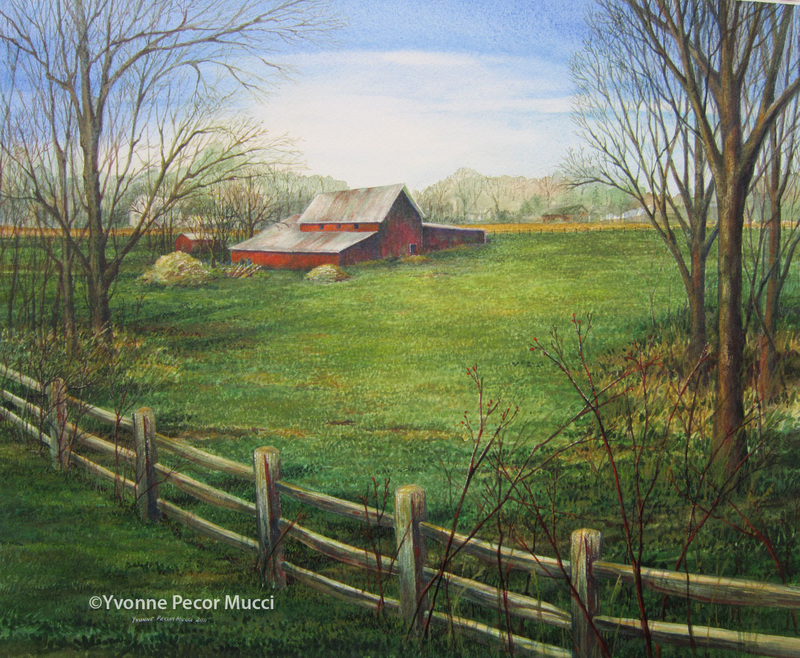 This painting is currently on exhibit at the Gloucester County College. 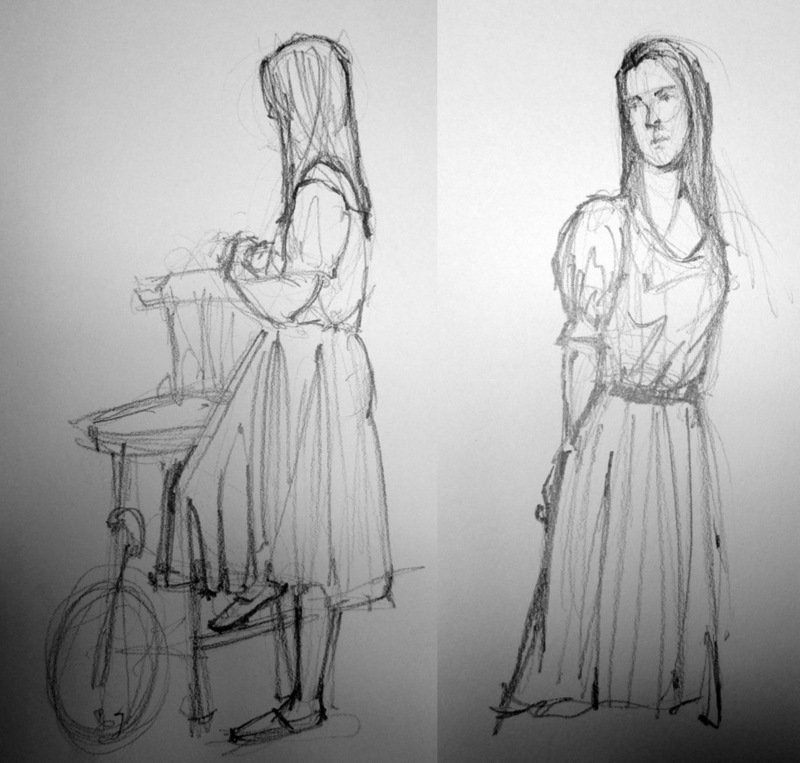 Sketching subjects and making notes for paintings is so important. It gives you the overall tone for the painting. The camera captures everything, but it also flattens the scene. You can take notes on color and value for use when you’re in the studio. For me, making quick sketches along with taking photographs lets me figure out what I want to paint long before I pick up a brush. 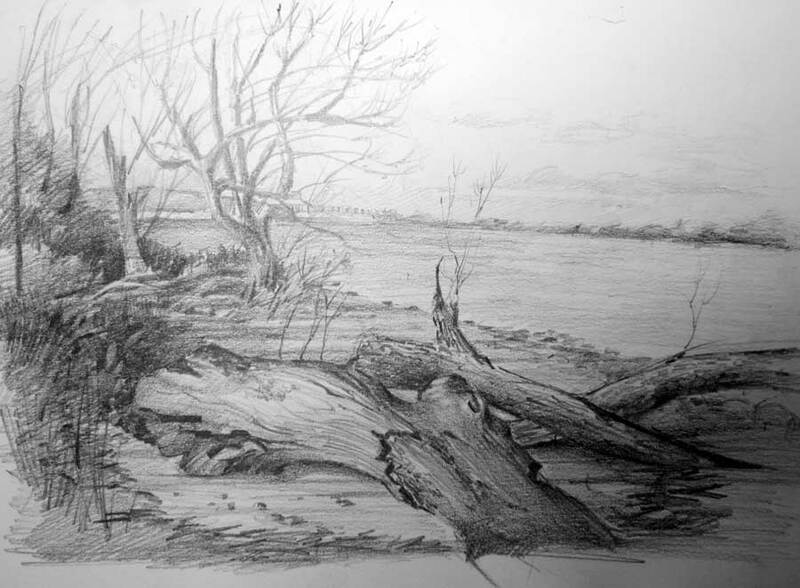 The combination of sketches and photos gives me a higher confidence level when tackling a tough subject.